Coco the Chocolate LabCoco is our 17 month old chocolate Lab, we got her in April, 2005. She likes to aggravate my other dogs and cats. 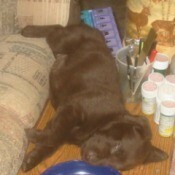 This is a picture of Coco right after I got her. She can sleep anywhere. Guiness (Cocker Spaniel)Guiness (Cocker Spaniel). 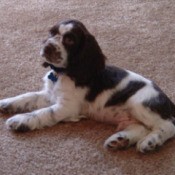 Guiness is a 2 month old Cocker Spaniel. My daughter just got Guiness. He loves to play with my grand-daughter Rebecca. 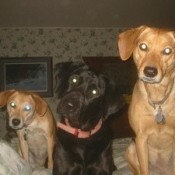 Maggie, Alvie and Nikki (Mixed Breed And Black Lab)Here are Maggie, Alvie and Nikki! Maggie is 10 years old, we got her from the pound. Alvie is a 6 year old black lab that we bought. And Alvie, age 8, was born here. 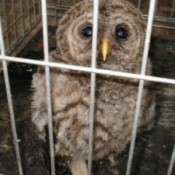 Baby OwlThis is our baby owl. It was on our road and wouldn't move when I drove by it so my husband brought it to the house. We fed it then put it up in the woods so it's mother could take care of it. We have people around here that would have probably run over the poor thing. Alvie 'All Grown Up' (Labrador Retriever)Alvie 'All Grown Up' (Labrador Retriever) Photo. This is another picture of Alvie with the 'Puppy Mumps'. For everyone that wrote to me, thank you. . .
Alvie, Tommy and Coco Lounging on the CouchAlvie, Tommy and Coco Lounging on the Couch. 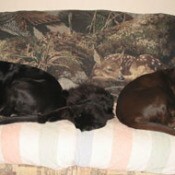 Alvie is a 3 year old black Lab, Tommy is a long haired domestic cat 4 1/2 years old and Coco is a 1 1/2 year old Chocolate lab.